Columbia – Murphy & Grantland attorney Elliott B. Daniels is among those to be honored by The State newspaper on Thursday evening. 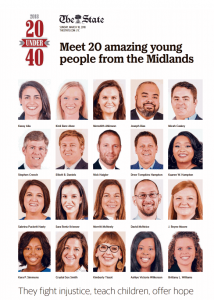 The publication’s annual 20 under 40 edition highlights the work of business, non-profit and civil professionals who are younger than 4o years-old. Daniels is leader in providing legal counsel to victims of human trafficking in South Carolina. The State publishes the only daily newspaper in the Midlands of South Carolina. The company was founded in 1891. Murphy & Grantland, P.A. is a civil defense law firm headquartered in Columbia, S.C. Dedicated to providing high-quality legal services with uncompromising integrity, the firm’s attorneys focus on achieving exceptional results. Clients include insurance providers, self-insured businesses, school districts, churches and nonprofit organizations as well as construction companies.